Some might think it should have been a tough week for JPMorgan Chase CEO Jamie Dimon. In fact, most of us around here thought the same thing. Instead, Dimon come out on top yet again. So how does this controversial, vocal and unabashed executive maintain this halo, even as he’s infuriating folks along the way? It could have something to do with the positioning of JPMorgan Chase he initiated during the tough economic times. There’s no denying this bank, with all of its dynamics, was then and to some degree remains still the strongest bank in the nation and a formidable player in an international environment. Come with us a we take a look back on some of his more… “colorful” decisions on everything from credit card regulations to the Volcker Rule. 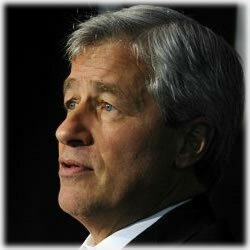 As many know, Dimon first majored in both Economics and Psychology at Tufts. He also graduated from Harvard with an MBA. He immediately went into the credit card side of finance and accepted a position with American Express, where his father had already built an impressive career. In a controversial and surprisingly quiet move, Dimon left the credit card giant after an undisclosed falling out. From there, he and a business partner, Sandy Weill, founded a finance company where he served as CFO. There’s no denying the savvy business sense he and Weill possess and if you’re looking for proof, look no further than Citigroup, which was founded by the partners. That soon fell apart, again with only few details released, and Dimon and Weill parted ways. He then found his way to Bank One, which was soon bought out by JPMorgan Chase. He was named CEO and the rest, as they say, is history. The controversy behind the 2008 Trouble Asset Relief Programs and JPMorgan Chase has everything to do with Dimon. He oversaw the transfer of funds that totaled $25 billion, all the while insisting the bank didn’t need it and that the government all but forced the bank to take it. It was the fifth largest transfer with the program and was designed to help banks with overwhelming mortgage loans. Dimon insisted the bank was in good shape, but said the “big banks” took the money so the nation’s smaller financial institutes wouldn’t appear to be “singled out”. He told Bloomberg, “JPMorgan would be fine if we stopped talking about the damn nationalization of banks. Now, they’re (government) beating up on everyone, saying look at all these mistakes, and we’re going to come and fix it”. He insisted every division of the bank was thriving, from the Chase credit cards to business financing to international considerations. In September, 2011, Jame Dimon and Mark Carney, Bank of Canada governor, found themselves in a very loud, very vocal and very unprofessional brouhaha. Worse, there were more than twenty other bankers and financial officials who witnessed it; and in fact, Goldman Sachs CEO, Lloyd Blankfein, was forced to step in and physically removed Dimon from the conference. Dimon told Carney that that many the newly proposed rules discriminated against American and that he intended to continue with his anti-American label. In an interview with Financial Times, he said the surcharges were not necessary and that new regulations would make it difficult for banks to earn profits. It could have had more to do with news of his earnings in 2010, though. Almost simultaneously, the next storm was brewing and it was a big one. In 2010, Jamie Dimon earned an incredible $20.8 million dollars as his salary. This was up by 1,541.5% from 2009 and totaled more than $6 million in cash and $14.2 million in stock options. Dimon knew then his 1,500+% raises would come under fire if regulators were to plunder deep. What he hadn’t counted on, however, was the Occupy movement that was getting its bases covered as it prepared to bring the 1% down. The movement clearly underestimated Dimon as he breezed through yet one more controversy with absolutely no battle wounds. JPMorgan was, in effect, the banking back-office for the Madoff Ponzi scheme, shuffling piles of money from one account to another at Madoff’s request… had JPMorgan done even a perfunctory job of due diligence and fulfilled its duty to report Madoff’s illegalities, it would have saved investors millions of dollars. Now, of course, the latest scandal that continues to unfold has once again managed to avoid a direct hit on Dimon. He breezes through these controversies and scandals unscathed, time and again. There was an announcement made regarding the FBI’s move towards a probe in the $2 billion mistake made in recent weeks; already, insiders are saying this is being done for appearance only.